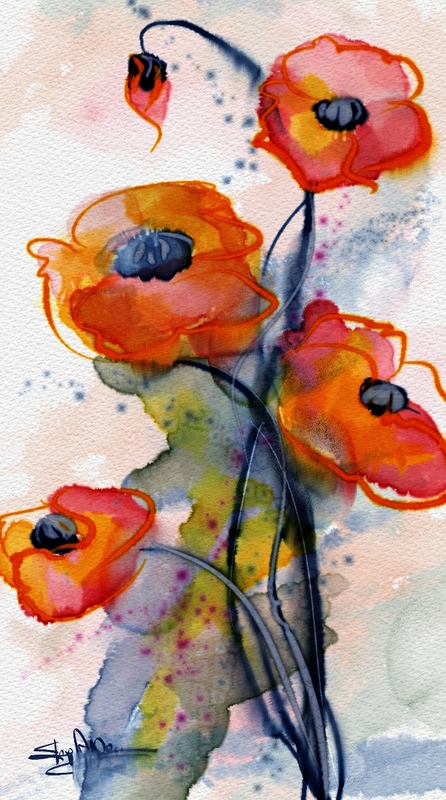 Wet Poppies, Corel Painter 2015, Real Watercolor, Watercolor, and Particle Brushes. That’s beautiful Skip! This is what I thought I would be able to do with Painter 12 and x3. Did it take 2015 to get these results? Are you going to do a demo of this? Most of what you see here can be done in X3 or 12. A lot was done with Real Watercolor and Watercolors. I will probably do a demo of something like this in the class; not sure if I will do one on the blog, yet. One of my brushes, wetting agent, is in the 2015 version of Painter. It is what I use to make the wettest areas and that one isn’t available in X3 or 12…so some of what you are seeing can only be done in 2015. Thanks for the compliment…and I hope my comment is helpful. When and where do you do classes? Can anyone join and what is the cost.? I teach at the Digital Art Academy. My new class starts Aug 19th. If you will go to this blog post you will get the link and some information about registering. Digital Art Academy Post. Anyone can join and the cost is $55.00 US.